On October 9th, 2012, Tropical Foods had its Flavors of the Fall Recipe Contest with the culinary students at the Charlotte Campus of Johnson & Wales University. 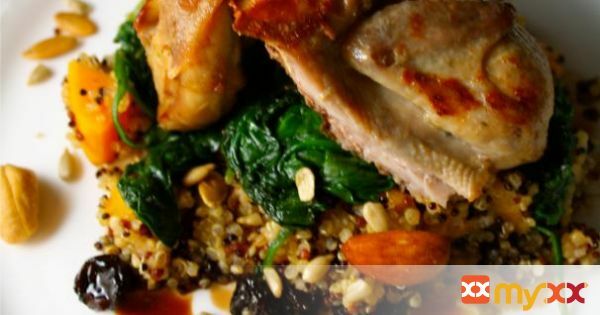 This recipe, Autumn Harvest Quail, was created by Allegra Grant. 1. Separate raisins from nuts and seeds in trail mix. 3. Stuff each quail with ½ shallot, one garlic clove, one orange wedge, one sprig of thyme, one sprig of rosemary. 4. Rub quail with butter, season with salt and pepper. 6. Then at 375 degrees for 30 minutes. 8. Slowly simmer until it is thickened. 9. Boil chicken stock; add quinoa and butternut squash. 10. Simmer gently for about 25 minutes. 11. Toast nuts and seeds from trail mix in butter with garlic and shallots. 12. Sauté spinach with mixture, then deglaze pan with white wine and season with salt and pepper. 13. SERVING: Remove quail from oven and rest for 2 minutes. Sauce plate; add bed of quinoa, top with spinach mixture, and quail.